Comedy is a curious beast even at the best of times. Across the world’s national film industries, thrillers, horrors, romances and action films share many common elements, while comedy tends to be fall in line with indigenously codes. I’ve said it before but it bears mentioning again: for foreign viewers, Korean comedies are a tricky proposition. Dialogue-based humor is often lost in translation and societal quirks, idiomatic expressions, customs and cultural references further complicate our relationship with these works. My knowledge of Korean is steadily rising (and had a big bump during PiFan) so I’m starting to see things that I may have missed out on before and Over My Dead Body, which was presented in the World Fantastic Cinema section is proof of this but still doesn’t convince me that comedy is a forte of Korean cinema. It’s another of the many high-concept, mid-budget and low-brow comedy-thrillers that the industry has been churning out for some time. Having exploited certain generic combos, like the gangster-romance comedies (Marrying the Mafia and My Wife Is a Gangster), to the point of depletion, comedy writers have gotten into a habit of concocting increasingly outrageous premises in the hopes of eliciting laughs through the sheer absurdity of their narratives. Mostly I haven’t been convinced, but keep in mind that my opinion is mitigated by my lack of Korean. Last year gave us Head, a complicated story involving the retrieval of the head of a scientist. Despite a gargantuan amount of zany set pieces, it wound up on the wrong side of kitsch and could certainly not hold a candle to Save the Green Planet (2003), which it seemed to be attempting to emulate. Rather than a head passing through criminal hands, this time it’s a full corpse that gets ferried to and fro as various interested parties each stand to gain differently things from it. A slimy corporate head shuts down a lab, almost kills a scientist and steals a microchip. Suddenly, he is murdered and now everyone is after his body, including his right-hand man, the scientist’s daughter, another lab rat and a man pretending to be dead. Over My Dead Body stays afloat on the strength of its performances, but only by a nose. The welcome presence of Lee Beom-su and Ryoo Seung-beom balances out what becomes a convoluted mess of a story with far more secondary characters than its narrative can support. While the premise didn’t have me in stitches, which has been a regular complaint with these films, I was able to pick up on a few more of the gags in the dialogue than I imagine I would have been able to before. These didn’t save the film from anonymity but given some time and a little more practice on my part, perhaps I will come to love these quirky little films. 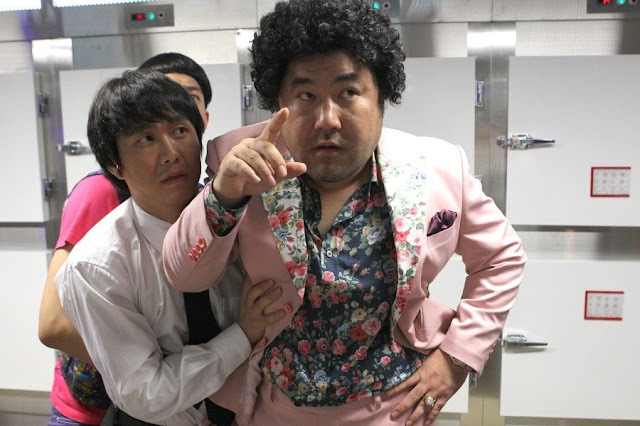 However, this still wouldn’t change the fact that Korean comedies are a tough sell abroad. As it stands, Over My Dead Body is not a film I can recommend to a western audience.